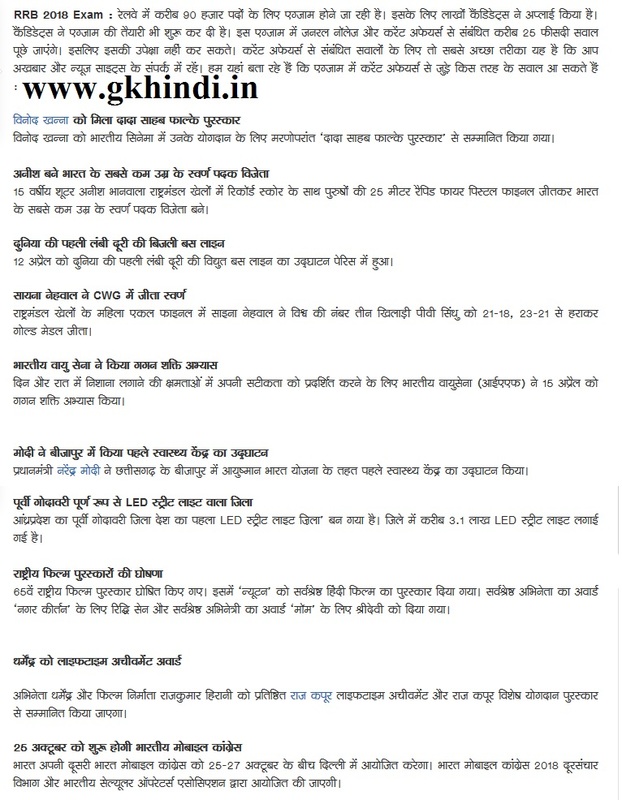 1.एक वर्ग गज में कितने वर्ग फुट होते हैं? 2.किसी भी अपराध की साजिश रचने वाले पर आईपीसी की कौनसी धारा लगाई जाती है? 3.जैन धर्म के 24वें तीर्थंकर भगवान महावीर का जन्म कहां हुआ था? 4.रामगढ़ विषधारी अभयारण्य कहां है? 5.असम में कितनी संसदीय सीटें हैं? 6.अरुणाचल प्रदेश के सियांग क्षेत्र में शरद ऋतु के देवता (पोड़ी बरजी) के लिए कौनसा नृत्य किया जाता है? 7.वर्ष 1967 का ज्ञानपीठ पुरस्कार किन्हें दिया गया? 8.मकर संक्रांति की पूर्व संध्या पर सिख समाज कौनसा त्योहार मनाते हैं? 9.नकटी माता का मंदिर कहां है? 10.केरल हाई कोर्ट की पहली महिला जज कौन थी? Vinod Khanna was awarded posthumously the ' Dada Honor Phalke Award ' for his contribution to Indian cinema. 15-year-old shooter Anish Bhanwala became India's youngest gold medalist by winning men's 25 meter rapid fire pistol finals with record score at Commonwealth Games. The opening of the world's first long-range power bus line on April 12 happened in Paris. Signed in women's singles final of the Commonwealth Games Nehwal won the world's number three player PV Sindhu to beat the gold medal from 21-18, 23-21. The Indian Air Force (IAF) practiced Gagan Power on April 15 to demonstrate its accuracy in day and night capabilities. Prime Minister Narendra Modi inaugurated the first health centre under the Ayushaman India scheme in Bijapur of Chhattisgarh. East Godavari District of Andhra Pradesh has become the country's first led street light district. Around 3.1 lakh LED street lights have been planted in the district. 65 They were declared National Film Awards. "Newton" was awarded the best Hindi film. Award of Best Actor for ' Nagar Kirtan ', Riddhi Sen and Best Actress award for ' Moms ' was given to Sridevi.